Stocks Unleashed: Mudajaya (RM4.10) surged on excellent results!! Mudajaya just posted its results this evening. Its performance was excellent, even beating my expectations for this year. This year's net profit most likely will exceed RM100mil which translates into 27 sen per share. Consequently, the share price shot up by 22 sen in anticipation of the favorable quarterly results. Performance: On y-o-y basis, revenue and net profit rose 78% and 337% respectively whereas its net margin rose to 17.7% from 11.8% in 3Q2008 and 14.5% in 2Q2009. On q-o-q basis, revenue increased 9.5% while net profit was up 33.4% due to higher margins. 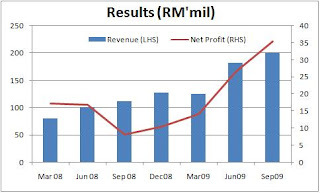 Cumulative wise (9-month ending 3Q2009), revenue and net profit rose 173% y-o-y and 218% y-o-y respectively. The better performance was due to increased revenue contributions from its construction activities.